At the end of April five of our older Scouts took part in an independent hike and camp as part of the Expedition Challenge Badge. The Scouts had been planning this adventure since January and decided on the route, food menu, data recording, created a risk assessment and organised all of the equipment themselves. They set off from Reading station travelling by train to Southampton then took the ferry to Hythe Pier to complete a study on the UK’s oldest continuously operating pier railway. Hythe Pier opened in 1881 and the narrow-gauge railway in 1909. After taking photos, completing their vlog using GoPro’s, audio logs, taking notes and pictures, they started a 10km hike across the New Forest to the Ferny Crofts Scout Campsite, capturing details of the wildlife they encountered including wild ponies, frogs, tadpoles and lots of cows! The Scouts set-up camp and met the leaders, built a fire and cooked their spaghetti meatball supper whilst trying to dodge the downpour experiencing one of the worst storms to hit the south coast with extreme rain, lightning and thunder! In the morning the Scouts cooked a pancake breakfast before breaking camp and walking the 6km to Brockenhurst to catch the train back to Reading. Joe, Lucy, Luke, Jacob and Matthew really enjoyed the weekend despite sore feet and getting lost a few times. They were thankful of Google Maps and GPS as a fall-back to their map and compass! As a follow-up In May the five Scouts presented back to an audience of parents, siblings, the troop and Geoff Barnes Loddon District Commissioner, Nigel Board Assistant County Commissioner and our 1st Wargrave Leaders using slides and animated videos. They had such a fun time and were duly awarded their Expedition Challenge Badge. For four of the Scouts, this was the last of the nine Challenge badges needed to complete the Chief Scout Gold Award. The Chief Scout Award is the highest award in the Scout section and recognises a significant personal achievement and contribution to Scouting. 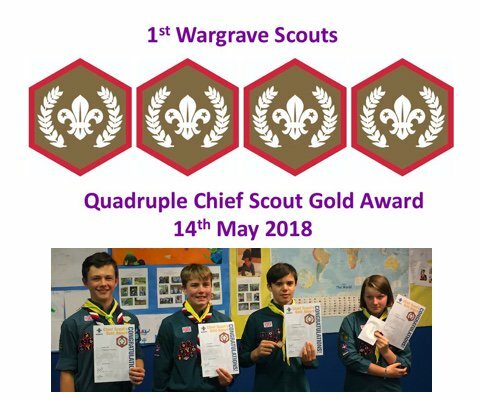 At 1st Wargrave for the first time since the Group was started back in 1909 we were able to make a quadruple award to our current Patrol Leaders: Joe Tubbs, Lucy Hucker, Luke Walsh and Jacob Worthington. These awards involved a new syllabus that was introduced only two years ago. 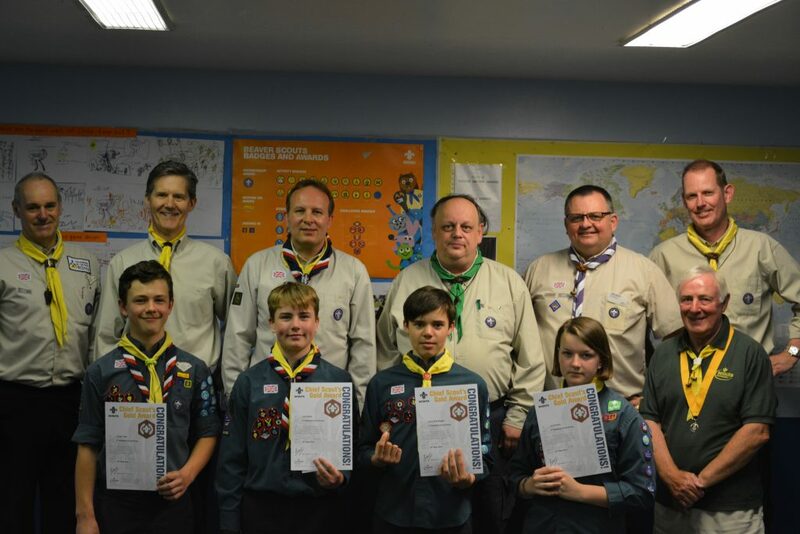 Our District Commissioner highlighted the individual effort required to complete the nine Challenge badges (Adventure, Expedition, Personal, Creative, Teamwork, Team Leader, Skills and Outdoors). As Leaders Richard, Paul and I are really proud of the commitment and effort Joe, Lucy, Luke and Jacob have demonstrated during their time at Beavers, Cubs and Scouts culminating in this award. We wish them well and all the best as they continue their Scouting at Loddon Explorers in September. During June and July, Scouts will be building bridges using pioneering knots, staffing the Wargrave 10k water stations, playing Danish Long Ball, hiking along the Thames, competing in Dragon Boat races and battling with NERF guns – before the term ends with our traditional Summer BBQ! See our Summer Term 2018 Programme for more details. Over the next 12 months we have a number of Leaders retiring and moving-on from 1st Wargrave Cubs and Scout sections. This means that we will be looking for a new team of volunteers to come forward to maintain Scouting in the village. We are also on the lookout for people to join as trustees on our Exec Committee which organises social events and maintains our charity finances. If you are interested in providing young Wargravians with the opportunity to experience the outdoors and help them grow and develop life-long skills, please do get in touch by emailing: gsl@wargravescouts.org or speak to Pete Fry the 1st Wargrave Group Scout Leader.